She is 13 years old and a middle level dagger user. She is a very cheerful and sweet girl. 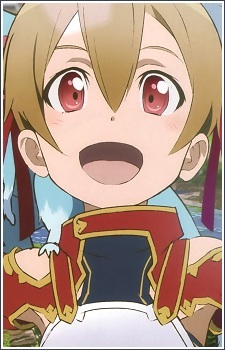 She is one of the very rare 'Beast Tamers' in SAO. She has a very rare familiar a 'feathery dragon' that she named Pina after her cat in the real world. She treasured Pina a lot and was the reason she survived in the game. Aside from being a female player, she is also a Beast Tamer and thus perceived as an idol amongst the middle level players. She received endless invitations from parties and guilds who wanted an idol player to join them to get more fame. Because of the attention she got, she became overly proud of herself and left a party one time after a misunderstanding. She got surrounded by monsters and lost Pina in the end. She was then rescued by Kirito who was passing by and helped her to resurrect the dead familiar. Kirito then revealed after getting the revival item that he got close to Silica because she was targeted by the orange guild, Titan Hand. He received a request from a player to have this guild be put to prison after getting ambushed and his comrades got killed. After showing superiority in level, they surrendered and were sent to prison. She wanted to join Kirito in the frontlines but they had a huge level gap and she will not survive there. Kirito assured her that levels don't mean a thing as they are already friends. When she transferred her game account to ALFheim online she brought Pina with her. In ALFheim Online she chooses the Cait Sith race. After the ALO incident she is shown to go to school with Lisbeth, Asuna and Kirito and along with Lizbet makes a "pact" to allow Kirito and Asuna to have one month together without interference before they attempt their individual moves on Kirito due to their feelings for him.